We try to keep our FAQ page as up-to-date as possible with as many answers as possible. If you can’t find what you need here, please visit our Contact page; we’ll try and get back to your query as soon as possible. What are the differences between v2 and v1 Snuggly Rascals? Version 2 (v2) is available in new characters, comes in new packaging, includes puzzles and stickers and the speakers are now in a single wire configuration. The speakers have also been enhanced to ensure a high level of audio performance in all environments. What size head do the headphones fit? There are large velcro pieces at each end of the headband which means they should fit any kids head (and most adults!). The size range is 38cm to 58cm and there’s also a bit of give/stretch with the fabric if needed. How can I adjust the size of the headband? You can adjust the size for a snuggly fit using the Velcro at the end of the headband. To tighten/loosen the headband please see the images below. 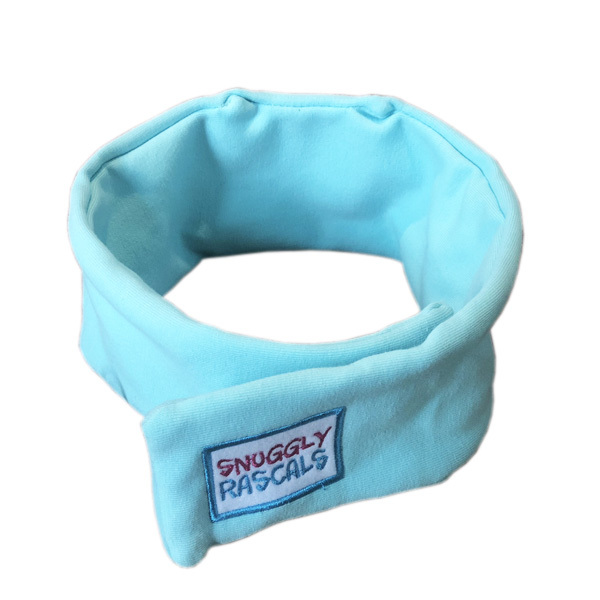 The end of the headband with the Snuggly Rascals logo on it can be adjusted to the edge of the white Velcro tab to increase the size. To reduce the size move the logo end to the other end of the Velcro tab. I have problems with the velcro fastening. There is a thin piece of material/film covering the curly part of the velcro fastening. This is there to protect the integrity of the velcro before usage. Please remove this thin material/film for the velcro fastening to work correctly. Is the volume limited? What is safe usage? Our headphones are set to 85 decibels and designed for usage with devices such as tablets and mobile phones. This is a recommended standard to protect hearing over longer periods of usage. Please note, volume levels may vary depending on your audio source & 85 decibels may be exceeded with audio sources with higher amplification levels. We recommend adult supervision at all times, take regular breaks (minimum 10 minutes every 1-2 hours) and avoid usage at maximum volume if possible. Will the headphones be loud enough for an airplane? Yes, Snuggly Rascals are ideal for long or short haul travel. Can you send me higher/lower volume speakers instead? The sound is a bit quiet/I can't hear anything. What should I do? 1) Check the connection (3.5mm audio jack) between the headphones and the device (tablet/phone etc). Ensure it is properly clicked in, and there are no protective cases/covers stopping a secure connection. 2) Check the positioning of the speakers within the headband. The speakers can be moved (and removed for washing purposes), so ensure the speakers are over the ear when the headband is worn. 3) Double check the speakers are not facing the wrong way in the headband. There is a navy blue side to the speakers. The navy blue side is where the audio comes out from; this should be facing towards the users head/ears. 4) Try using other devices (tablets/phones) to test and put the volume on maximum. Some tablet devices designed for children are already volume limited, so this would reduce the volume of our headphones to lower than 85 decibels which would make them very hard to hear. If there is still no audio coming from the headphones, then please email info@snugglyrascals.com and we can arrange a replacement set of speakers to be sent. Can you remove the headphones to wash the band? The headphones can be removed from the headband via the openings on the band. The headband can be washed, the washing instructions can be found inside the headband. My speakers have broken, can I get a replacement set? Yes. Should you need to a replacement set of speakers, please email us on info@snugglyrascals.com or via our Contact Us page. Please note, we may respond requesting a proof of initial purchase. Is there a particular way to wear the headphones/wire? Feed the speaker wire(s) out of the headband and down the back of the head/neck, before connecting to your device. Is there a wireless version? We are currently working on a wireless version and we will hopefully be able to release the product by mid 2019. What ages are the headphones suitable for? There’s no upper age limit to who can enjoy Snuggly Rascals headphones. However, as with any set of headphones, the cord/wire is a potential strangulation hazard, so we recommend a lower age limit of 3+ years. However, we are aware that many customers have children of younger ages using our products. We always recommend adult supervision for children of all ages though. Is it safe to sleep with these headphones on? As with any set of wired headphones, although the risks are very small we would recommend that children do not sleep with the headphones on unless supervised by an adult.